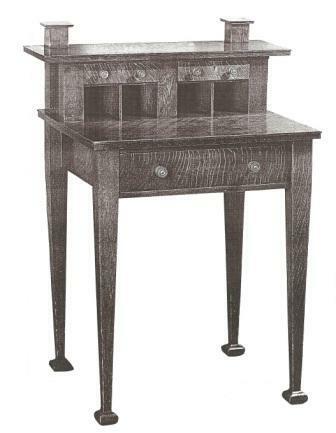 This is a copy of of the famous desk by AH Mackmurdo. It exercised quite an influence over designers like his friend, CFA Voysey, and other Arts & Crafts designers. 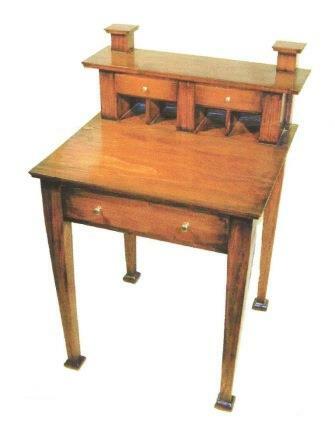 The feet became a trade mark of much Arts & Crafts style furniture. It is essentially a bonheur De jour, that most feminine of pieces of furniture; but here it takes on a much more male and 'honest' feel. This copy, while not in oak as the original, is a very close match in colour and tone. Made to order. Delivery time will be quoted at time of ordering.